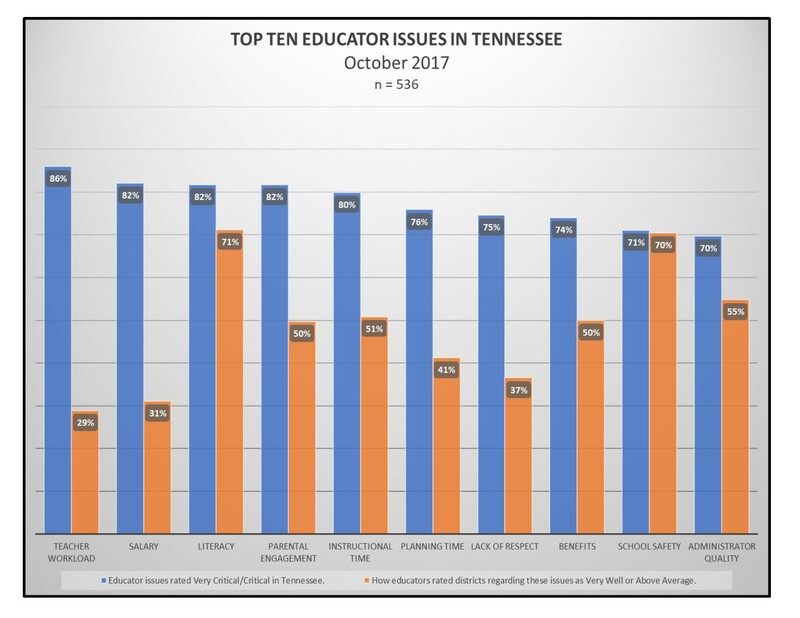 In the 2017 State of Tennessee Education Survey, teachers responded to questions on 20 topics regarding education. Teacher Workload was rated as the most critical, followed closely by Salary, Literacy, and Parental Engagement. Ten of the topics were ranked as “Critical” or “Very Critical” by at least 70% of respondents. 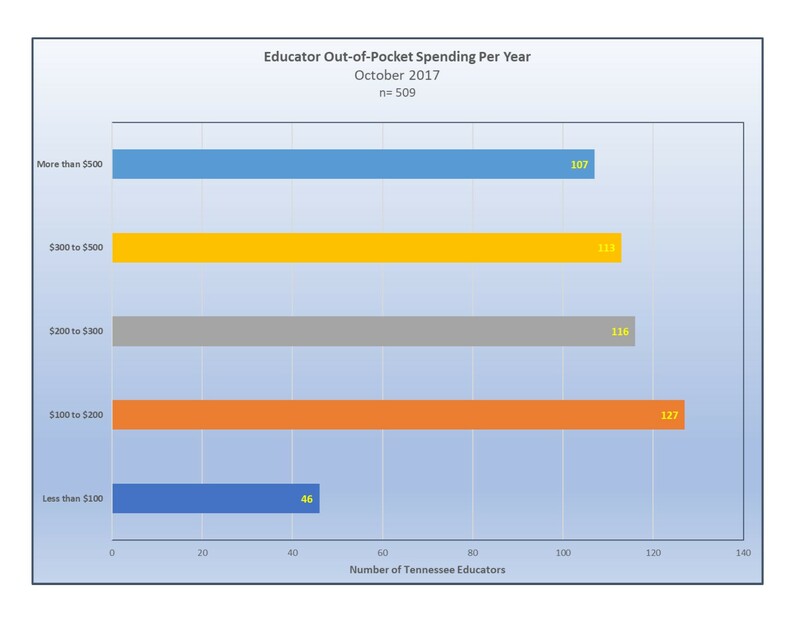 The results come from Professional Educators of Tennessee’s annual membership survey. Responding to this survey were 536 educators from over 81 districts. Educators were asked to rate the following issues as being Very Critical, Critical, Somewhat Critical, or Not Critical. They were also asked to rate how they felt their district or school addressed the same issues. According to the survey (in order), the top 10 most critical issues were: Teacher Workload, Salary, Literacy, Parental Engagement, Instructional Time, Planning Time, Lack of Respect, Benefits, School Safety, and Administrator Quality. What is interesting to note on this survey is not just which issues educators thought were most critical but how they perceived their districts/schools as addressing these issues. Only 29% of educators rated their districts as being above average concerning their workload. Educators rated districts at 31% above average for addressing salary issues. Whereas Literacy and School Safety were also considered critical issues, educators rated their districts well regarding them. In addition, educators were also surveyed regarding their out-of-pocket spending. Ninety-one percent indicated they spent more than $100 a year with 21% stating they spend more than $500 per year out-of-pocket. One educator stated they spent more than $1000 per year while another stated they spent more than $2000. Also of significant note was which issues were not considered as critical by educators. Surprisingly, Testing and Teacher Evaluation were not in the top 10 most critical issues. Ranked 11-19 were Teacher Quality, Testing, Poverty, Quality Resources, Technology (or lack thereof), Hunger, Teacher Evaluation, Standards, and Professional Learning. In regard to Professional Learning, training provided outside of the district appears to be more specific to educator needs. The survey also included the opportunity for respondents to leave general comments with an open-ended question. Two hundred fifty (250) educators left comments, and "test", "tests" or "testing" was mentioned 68 times. "[Teacher] evaluation" was mentioned 19 times. An issue that was not included in the specific topics that were surveyed, but that was mentioned in the open-ended question, was class size. Class size was a concern for several respondents, and we also feel it is a critical issue. However, the number one issue is undoubtedly excessive educator/teacher workload. Stakeholders at all levels should make it a priority to work together in order to reduce excessive educator workload, at the same time providing salary increases that will actually go into the teachers’ paychecks and not just to the district coffers. These results generally align with previous findings from past surveys. Additionally, we feel it is also imperative that the state should ensure that classrooms are adequately funded and work to reduce teacher out-of-pocket expenditures. Professional Educators of Tennessee is a non-partisan teacher association headquartered in Brentwood, Tennessee. Permission to reprint in whole or in part is hereby granted, provided that the author and the association are properly cited. For more information on this subject or any education issue please contact Professional Educators of Tennessee. To schedule an interview please contact Audrey Shores, Director of Communications, at 1-800-471-4867 ext.102.